ComparativeConstitutions.org: Are Constitutions like Marriage? The convenant binding two people "til death do [them] part" seems to have much in common with constitutions. Both contracts are highly symbolic and probably confer some degree of legitimacy upon unions that will inevitably weather their fair share of crises. Both contracts, when entered into, are thought to last indefinitely. We can continue to be optimistic about any given union, but we know many of them are doomed to come apart. But how do the rates of divorce and constitutional replacement compare? Here I present some evidence from a book that Tom Ginsburg, James Melton, and I have just finished entitled The Endurance of National Constitutions (due out next month). [Tom and I hope to serialize some of the highlights from the book here in the next few weeks]. 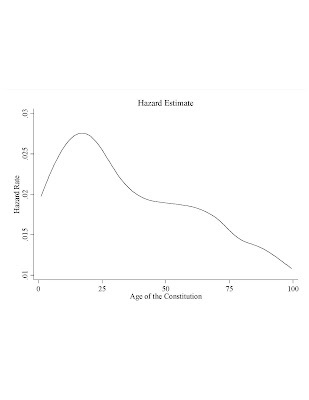 The figure above plots the hazard estimate of constitutional death, which is the probability of death conditional on having lived to a given age. The figure, then, charts the risk of death at various points in the life cycle of a constitution. Interesting data and metaphor! I’m no expert on these things, but a common figure suggests that a fifth to a quarter of marriages in the US end up in divorce, in most cases sooner rather than later. This stands in a stark contrast to the Norwegian overall numbers but also with the incredible endurance of the US Constitution. Great point. The irony of constitutional endurance in a land in which the marriage contract breaks down relatively quickly is intriguing. The figure you cite (1/4 of marriages dissolving in U.S.) may not actually be that far from the Norwegian number. After 20 years or so, an average rate of 2% divorces/year (the Norwegian rate) would result in MORE than a 1/4 of marriages dissolved. I'll have to track down the U.S. hazard curve to compare! Interesting approach. I'm looking forward to the book. Hopefully it will further inform discussions that deal with the anticipated need for and rate of political change in the decades ahead.